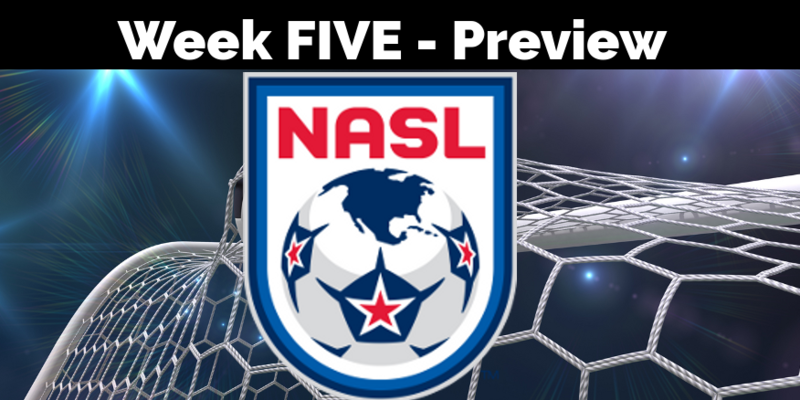 Week five of NASL action has an number of interesting match-ups not the least of is Monday night’s visit of unbeaten Minnesota to New York to face the defending champion Cosmos. Four games kick off the weekend on Saturday first though with Ottawa hosting Tamp Bay, Atlanta travelling down the I-75 to play Fort Lauderdale, the Indy 11 facing FC Edmonton for the first time at home and San Antonio hoping for another big crowd as they face league over achievers Carolina. The Fury meet the Rowdies for the first time ever and continue to struggle with both scorelines and injuries headed into the weekend. After getting everyone’s attention with a 4-0 win over Carolina in the their last home game the Fury failed to build on that momentum crashing out of the Canadian Championships losing 3-1 to FC Edmonton and then dropping a 2-1 decision to Atlanta last weekend. Ottawa is led by Brazilian Oliver, who has two goals and an assist this season. Goalkeeper Devala Gorrick, and defenders Mason Trafford and Drew Beckie are the only Fury players to play all 360 minutes of NASL league matches this season. The club remains without the services of forward Tom Heinemann (ankle) who misses his seventh straight match and midfielder Nicki Paterson (knee) who misses his fifth straight game. Maykon has joined the pair on the shelf after suffering a hamstring injury in the first half of last Saturday’s win over Carolina. The Rowdies picked up their first win of the season on May 3 in San Antonio, topping the Scorpions 1-0 courtesy of a Shane Hill goal in the 51st minute. Tampa Bay head coach Ricky Hill shuffled the Rowdies starting lineup from the three previous matches, handing Willie Hunt and Keith Savage their first starts of the NASL season. Hunt started at right back, with club captain Frankie Sanfilippo moving in to form a central defensive pairing with Takuya Yamada. Savage started on the left wing. Left back Blake Wagner is suspended for this match, having been dismissed from last weekend’s match for receiving two yellow cards. Wagner has started all four matches this season. Tampa Bay head coach Ricky Hill says his team must be ready to play a tight game on Saturday. Look for Ottawa to pick up their first tie of the season. Fresh off a 3-1 victory in Edmonton, the Fort Lauderdale Strikers return to Lockhart Stadium for the third home match of the Spring season against the Atlanta Silverbacks. The Strikers are not only looking for a third win in a row on the season, but also at Lockhart where the team has not lost since September 21, 2013. Last year’s Spring Champions Atlanta got off to a poor start in the 2014 campaign, falling 4-0 to the Cosmos in New York and then dropping a 2-1 decision to the San Antonio Scorpions at home. The team has won the two matches since, picking up a 3-1 win in Tampa Bay and a 2-1 win against Ottawa Fury FC last Saturday. These two sides played each other four times last season, and split the series right down the middle. The Silverbacks won the first two matchups, once away and once at home, in NASL Spring Season play, while the Strikers returned the favor in the NASL Fall Season. The is a battle between two teams that were perhaps undervalued by pundits going into the season, and each side will look to continue their winning streak and ascension up the NASL Spring Season standings. Look: The streak to continue for Atlanta as they pull of the upset on the road. The two teams holding up the rest of the standings meet with a lot more than just pride on the line at this point in the season. After dropping a pair of 3-2 losses away at Fort Lauderdale and Minnesota across the last two weekends, Indy Eleven will return to Michael A. Carroll Stadium to host FC Edmonton. Edmonton may come in a little weary after playing Wednesday night in the Amway Canadian Championship semifinals, but they’ll also travel to the States with momentum after securing a 2-1 win over Montreal Impact that marked its first victory over an MLS side in official competition. Both teams enter Saturday’s match-up still looking for their first win of the NASL Spring Season. Former Brazilian and Manchester United player Kleberson converted from the penalty spot for the second straight match and joined Erick Norales as the only Indy Eleven players will multiple tallies, their two goals placing tied for third in the NASL behind current Golden Boot leaders Christian Ramirez (Minnesota) and Zach Schilawski (Carolina). It’s difficult to look into the Eddies future and ignore the Amway Canadian Championship. Having participated in the competition for the last three weeks, it has caused the Eddies to rotate their roster as the team has played three games a week for the last three weeks. Look for home field and tired road legs to add up to the first Indy win of the season. Looking for their first home victory in 2014, the fifth-place Scorpions take on the RailHawks, who are currently in third in the league standings following a 1-0 win against the visiting New York Cosmos. The RailHawks extended their unbeaten streak to 18 games at WakeMed Soccer Park last week. However, San Antonio has won three of the last four encounters against Carolina at Toyota Field and hold the edge in the all time series at 5-0-3. If San Antonio can find the offence they’ll take the win at home but expect them to settle for yet another tie, their third in five games. After suffering a second consecutive 1-0 defeat, the league’s defending champs find themselves in the midst of their first losing streak since rejoining the NASL last season. As was the case in their home loss to San Antonio, the Cosmos could not manage to find a goal despite their advantage in possession throughout the match. The Cosmos once again found themselves on the wrong end of the scoreline despite creating their fair share of quality chances. Time and again, they were thwarted by RailHawks net minder and NASL Player of the Week Akira Fitzgerald. Managing to collect all 12 points from their first four matches, Minnesota has been a solid side on both sides of the ball thus far in 2014. Eight goals scored, three conceded, and only one of those was scored by the opposition from open play. Seven yellow cards, but no reds—one of only two teams in the league to have yet to go down a man. Selfless offensive play from the whole team has placed the team second in the NASL in goals scored, second last in goals conceded, and undisputed first place. Look for: The dam has to break for the Cosmos at some point the league leader in shots will eventually start finding the goal give them the edge at home.